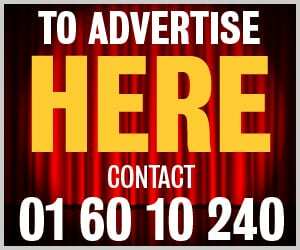 Hartstown Huntstown manager Paul Doody believes his side are capable of achieving promotion despite another disappointing result on the road. Hartstown Huntstown were pegged back at the death by Mount Merrion. The Blanch side led deep into injury time following a hard-fought battle with Mount Merrion in Rathfarnham on Friday night only to let the three points slip from their grasp. Merrion goalkeeper Tom Jackson scored a dramatic leveller as the sides played out a thrilling 4-4 draw in LSL Senior Sunday 1B on Friday night. “Our target is promotion this year,” said Doody, who took the reins of his first managerial job at the beginning of the season. An experienced coach within the FAI, the Dubliner is part of the Irish amateur side’s management set-up. “There’s no doubt about it. We want to get promoted – that’s what we’re there to do. We came in to complete that job. Nine-man Merrion had led twice during a topsy-turvy back-and-forth game but looked set to end up with nothing before Jackson gambled to come up for a corner in the dying moments. The spectators who made the trip to College Road for the evening kick-off were treated to their fair share of drama as no fewer than three players were sent off amid the eight goals. Merrion came into the game unbeaten in the league and they led within two minutes as Mark O’Dwyer turned home. Hartstown Huntstown weren’t shaken by the early concession and, despite playing into a strong wind, they equalised just shy of the half-hour. Ian Croft lined up a free kick from 25 yards and sent a rocket into the top right-hand corner that left Jackson grasping at air. The visitors completed the turnaround five minutes before the break as Croft grabbed his second, breaking the offside trap before lofting a perfectly-weighted chip. They held that lead until the break, but the tie was quickly turned on its head upon the resumption as Mark O’Dwyer scored his second before Joey Hall fired Merrion back into the lead. 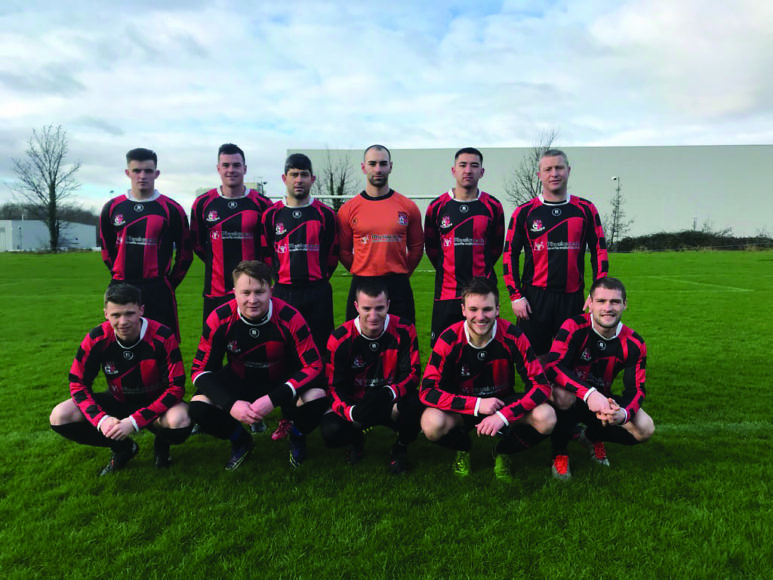 There was yet more drama to come as a coming together between Merrion’s Nick Skelly and HHFC’s Ian Brazil saw both players given their marching orders 20 minutes from time. The teams were soon level once more as substitute Ben Bosze, who had only been on the pitch a matter of minutes, broke the offside trap and rounded Jackson and slotted into an empty net. It was to get worse for Mount Merrion as Evander Chatara became their second player to be dismissed for a professonial foul. And Kenny Clince looked to have won it for the visitors in spectacular fashion when his left-footed strike found the top corner in the final minute. 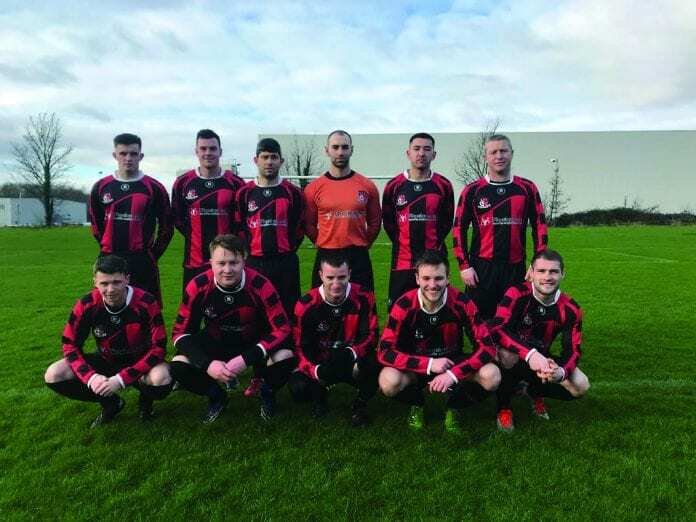 Mount Merrion dug deep, however, and they levelled in the fifth minute of injury time when a long throw wasn’t cleared and Jackson’s shot from 12 yards trickled over the line.